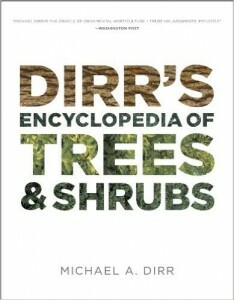 Posted in Gardening, Landscape, perennials, permaculture, pest control	| Tagged books, deer, gardening, landscape, perennials	| Comments Off on Deer Control? My person happens to be my dad. He has been the receiver of many lame gifts (let’s just say he has an extensive tie collection), but he now has become the giver of lame gifts! I think it’s his way of coping with the years and years of having to politely receive tie after tie, sweat pants after sweat pants and so on. He’s made a game out it – humorous (for the giver at least) yet thoughtful. Spoiler Alert: Uncle Den will be receiving a half full stamped Subway card. Yes, you’re right, they don’t do those anymore- he’s been sitting on this subway card waiting for it to mature properly for years now. 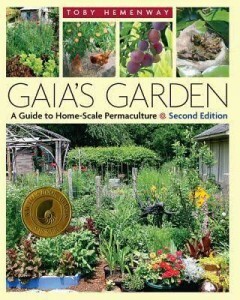 A good garden book (or ebook). 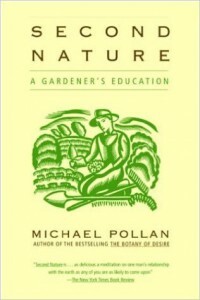 If you’re person doesn’t happen to be a gardener yet, I highly recommend Micheal Pollan’s Second Nature. It’s about his first trials when he decides to really get into gardening. This may not sound interesting at first glance, but Pollen is a very talented writer. Trust me on this one-he has even made reading about eating vegetables sound interesting (In Defense of Food). Now that’s talent! 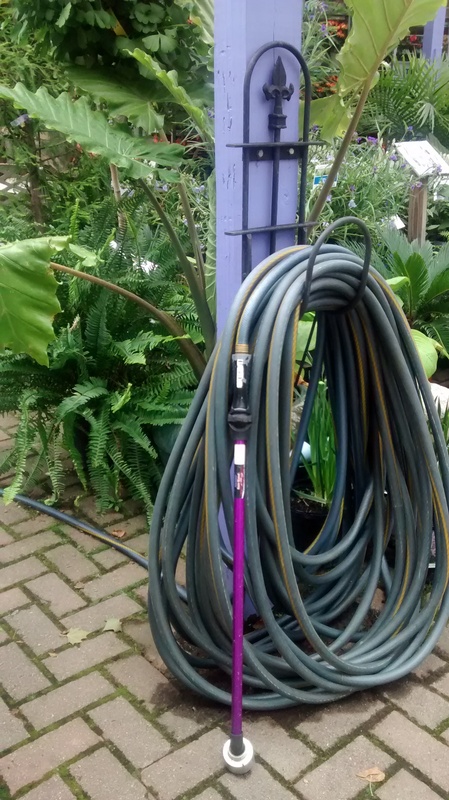 The best tool a gardener could ever own. 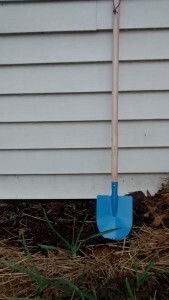 What about a shovel you say….Think I’m over selling? Think again. It’s simple handle tool,like any worthwhile tool, it’s capable of many different tasks. 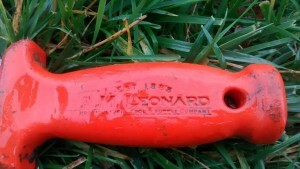 Every time I’m out in the yard I use this tool. What could this amazing tool be? It’s called: The Soil Sword. 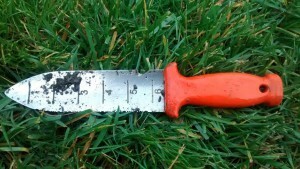 Well actually it’s called a soil knife (I need to talk to their marketing). I wonder too if we can figure out how to play the clip in Crocodile Dundee where a guy tries to jump him with a knife and Paul Hogan says, “That’s not a knife….This is a knife.” And busts out his crazy looking more-like-a-sword-than-knife knife. Yeah, it’s kinda like that- empowering. Anyway, why bright orange? It’s A.M. Leonard brand, located right here in Portsmouth, Ohio. And it will last. So it looks impressive…but what does it do? 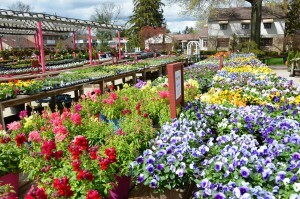 It is great for weeding, bulb planting and plantings annuals. 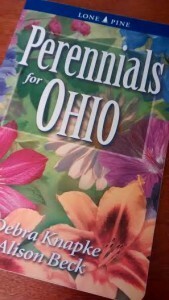 It’s also great for splitting perennials (cuts them like butter). And it is the only tool I know of that cuts through burlap and twine without getting jammed up. I used it to dead head perennials and grasses. It can also cut through roots or help loosen roots when planting anything that had become pot bound. I’ve also used it to cut through plastic pots to retrieve grossly pot bound plants. It’s an extremely useful tool and I highly recommend it. However, if you’re trying to buy for a child, stick to that shovel idea. There are small versions available which are great for those with little hands. Just go with one that has a wooden handle and a metal shovel head. This way there will be no tears when they go to use it! Good boots. 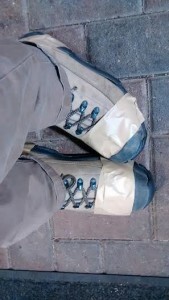 For the avid gardener, well, they’ve been known to wrap their shoes in duct tape when desperate. When you’re on your feet a lot, shoes breakdown at surprising speed. Investing in a pair good pair of boots is definitely worth it – but we hardly do it for ourselves. I’m currently trying out insulated Bogs® boots. Slightly more fashionable than duct tape – function before form in this case. My feet have stayed toasty warm and most importantly, dry this holiday season. And I bought Bogs® because they were actually recommended to be by a co-worker that has their pair for going on three years now! 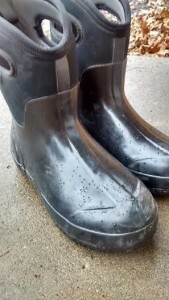 If a pair of boots lasts one season in the nursery industry that is considered good. There are other style offerings by Bogs® that attempt to be more flattering and are still of good quality. Still not sure what to get? 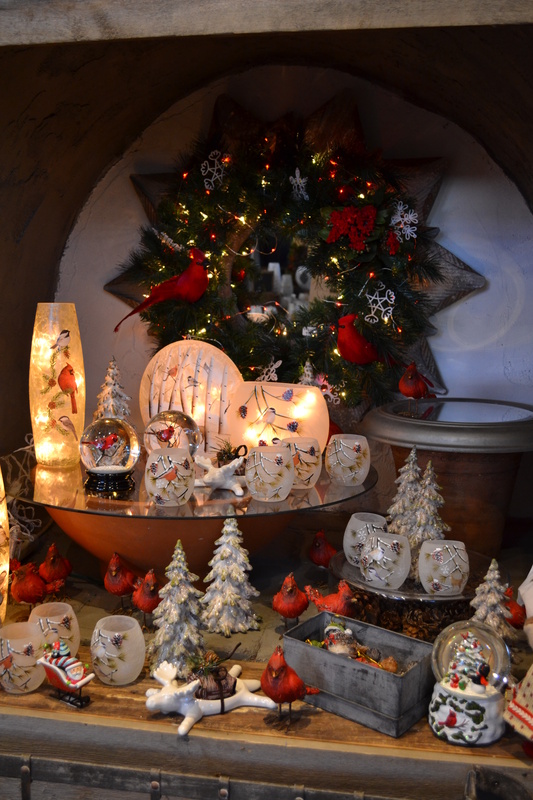 I know it is a busy time for so many, but why not pay a visit to one of our gift shops? You’ll find everything from fancy, functional to unique and especially quirky. Art (both garden and wall), bird feeders, bat houses, distinctive ornaments, educational toys and books just to name a few. 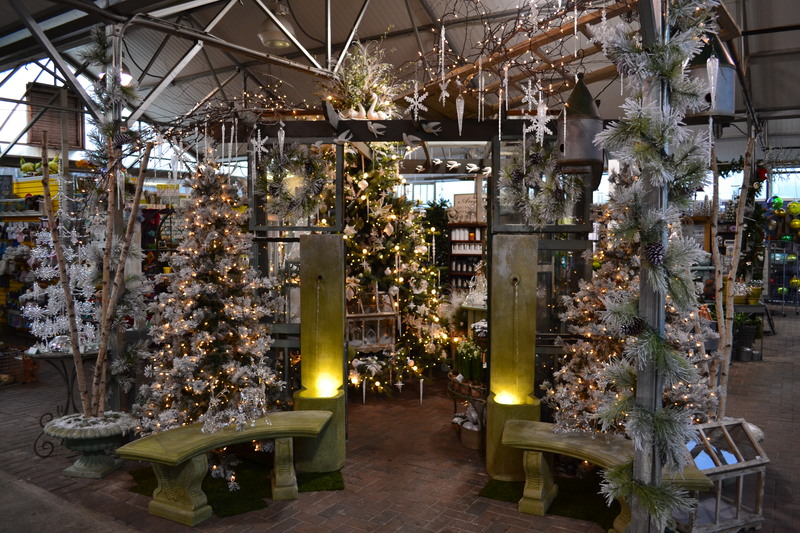 Not to mention…interior plants, seasonal bulbs, decorative pots and supplies. And of course, when in doubt a gift card to Oakland Nursery will be sure to please! This way you don’t have to worry about buying the wrong size or what have you – let those hard-to-buy-for pick out something for themselves! 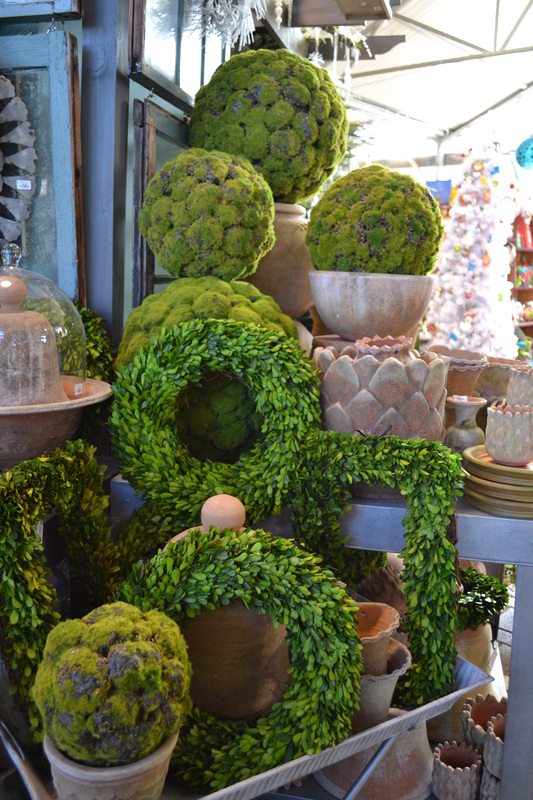 Wishing you Happy Holidays and Happy Gardening! 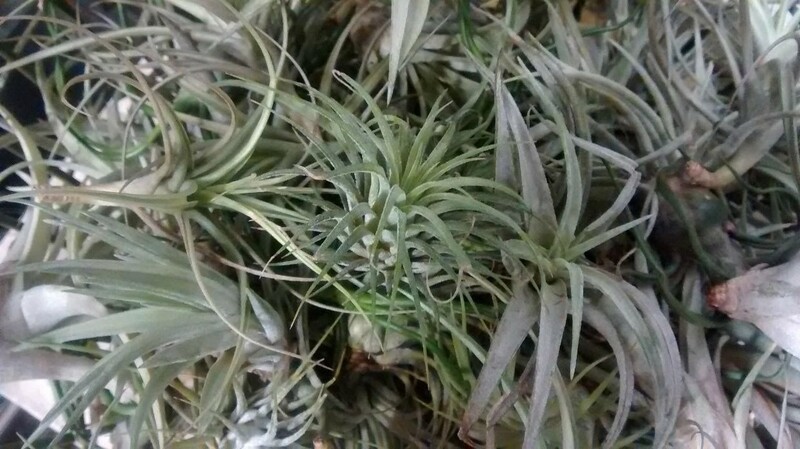 Posted in Airplant, Gardening, Low maintenance, Tropical	| Tagged airplant, houseplant, indoor plant, low maintenance, tropicals	| Comments Off on Trendy Tillandsia: Air Plants! You’ve decided to grow organic! Great, whatever the reasoning behind you’re decision I’d like to support you and your organic gardening efforts. My favorite bonus to growing organic is barefoot gardening! Having a healthy garden from the soil up is the most important step to warding off pests and diseases. And if you’re just starting out organically you need to build up your soil profile (we’re offering a free lecture on this in September) to obtain happy healthy plants. The most sustainable ways to change your soil into a goldmine of loose, nutrient rich organic matter of awesomeness takes time. And in the meantime, there are some organic pest and disease management products that can help bridge the gap. 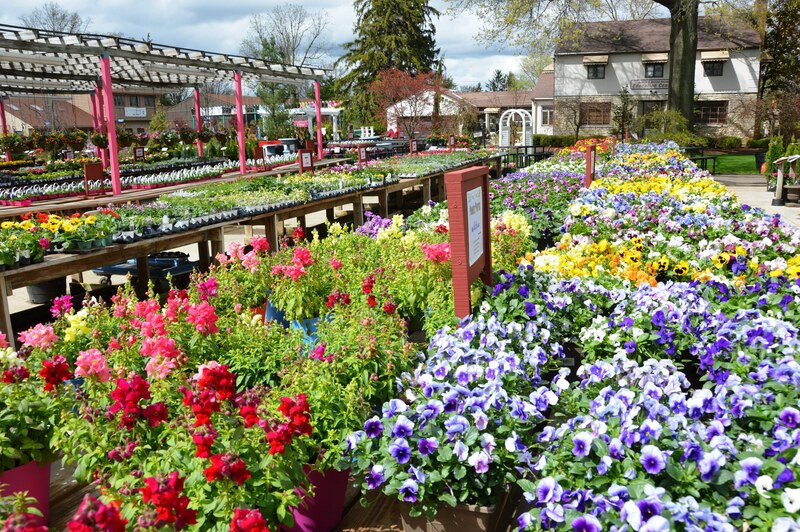 If you need a little help in the garden we want you to make sure your efforts aren’t wasted in buying something you don’t need. Here are need to know terms to keep yourself straight – the 411. 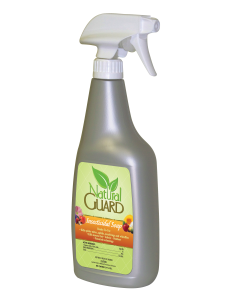 Insecticidal Soap: A long chain of fatty acids that break down insect’s protective coating while not harming plants. 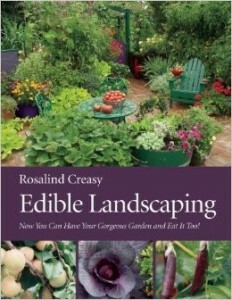 Safe for edible and non-edible plants. Direct contact is needed to be effective. 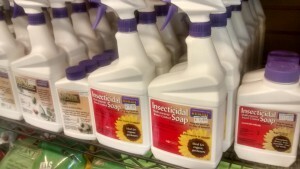 Do not use when beneficial insects, such as honey bees, butterflies, lady bugs, etc. are present. And only effective on insects, will not be helpful if you have a disease issue. Bt (Bacillus thuringiensis): A naturally occurring soil bacterium disease that is fatal to the larva stage of certain insects. 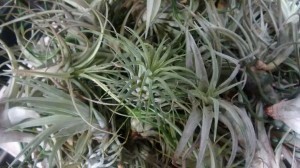 Applied to the leaves of plants in the evening, worms and other insects will ingest it, get sick, and die. Note: It is harmful to moths and butterflies, so don’t use it if you’re trying to protect monarch or other “good” butterflies! Diatomaceous earth: The fossilized remains of marine phytoplankton, DE works when sprinkled on and around your plants. When an insect or worm comes in contact with it, DE scrapes and cuts them open, killing the pest. 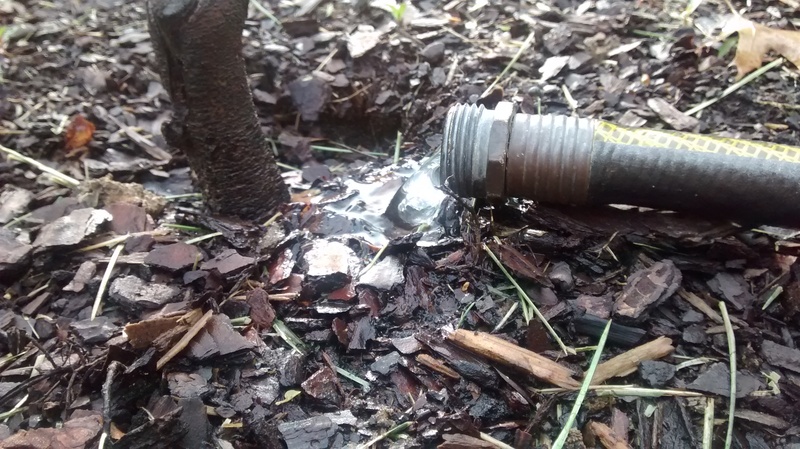 Works well for slugs too! Note: must be kept dry to work! 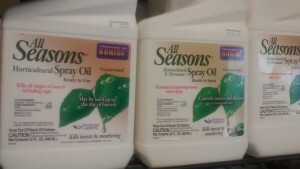 Horticultural oils: These oils have been around for decades and are harmless to people, animals and it evaporates quickly. The oil either suffocates insects or acts as a poison. Please be mindful when you spray because it can effect coloring on sensitive plants (such as, Blue Spruce or Blue Rug Juniper). 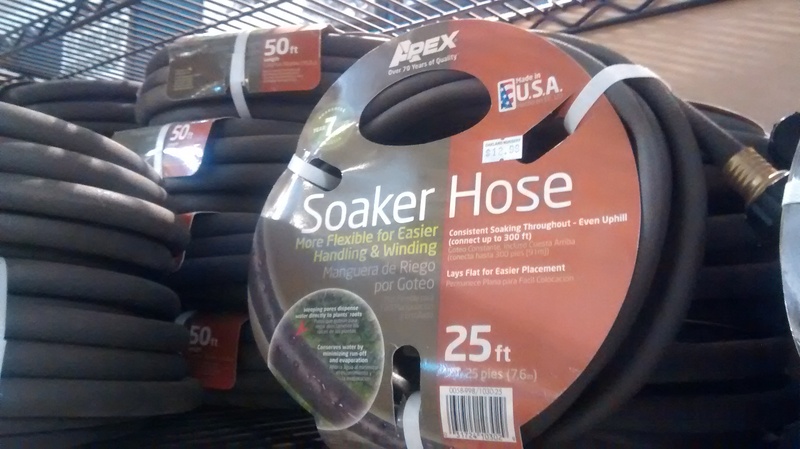 Also, it should be used in moderate temperatures. 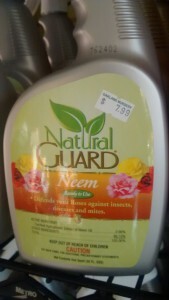 Neem Oil: Botanical insecticide, repellent and fungicide. BAM. Seriously, it’s extremely useful. Very low toxicity to humans, birds, bees and many other beneficial insects. I’m currently trying it out on the leaves of my raspberry bramble, because Japanese beetles of been out in full force. 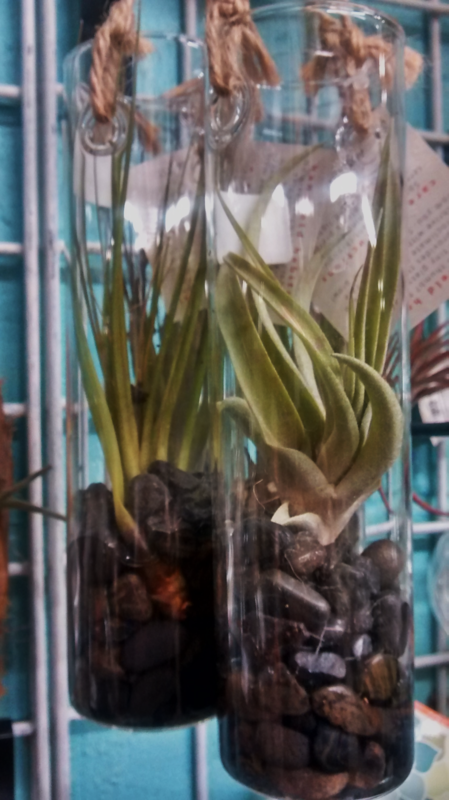 I usually just pick them off into some soapy water- but I’m going on vacation. I’m not going to allow those little jerks to take over while I’m gone, nor do I expect any of my lovely neighbors to swing by and knock off any for me. I’ll report my findings and let you know if Neem Oil deters Japanese beetles in addition to all its other pros. 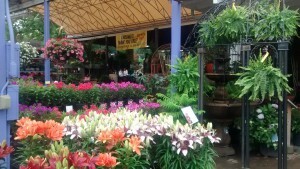 Keep cool and Happy Gardening! What an unusual summer we’re having, with our rainy June and now a rainy July! Although it hasn’t been the best for my basement, my summer flowers (and weeds) are crazy lush and starting to bloom all over the place. As you may be aware at this point, I’m a big fan of lists – Back in the good old days, I worked once at a music store, when CDs were still a thing and worshipped the movie High Fidelity. Although I have since fallen out of love with John Cusack, I’m still a big fan of music and lists. Without further ado, I am pleased to give you the…. Ascelias tuberosa, Butterfly weed. One of the more popular native perennials in recent years, this star owes its fame in large part due to its membership in the milkweed family. It’s one of the few plants where Monarch butterflies lay their eggs and larvae eat the leaves of the plant. 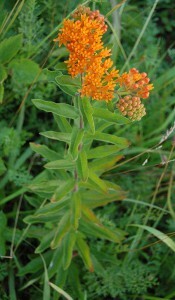 Butterfly weed, despite “weed” in the name, only grows to 1’-2’ tall and wide with bright orange clusters of flowers in summer. Looks its best when planted in groupings. 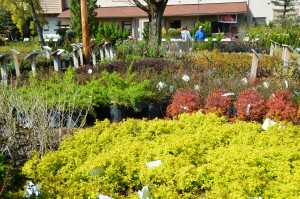 It can tolerate wet feet, making it a great accent in a rain garden. Full sun. Geranium, Hardy Geranium or Cranesbill. NOTE: not to be confused with Grandma’s favorite (red) annual. 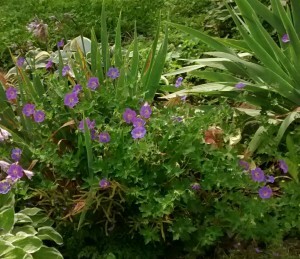 This perennial has a mounding-to-spreading habit (1’ high and 2’-3’ wide) that becomes covered in violet-blue or pink blooms in early summer and re-blooms into late summer and even into fall! It can take full to part shade. The two most revered varieties are Geranium x ‘Rozanne’, a 2008 perennial of the year award winner, and Geranium cantabrigiense ‘Biokovo’, a 2015 perennial of the year award. Needless to say, it’s a winner that should be enjoyed in your garden. 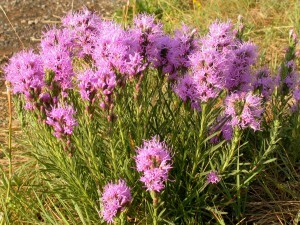 Liatris spicata, Purple gayfeather. Small purple (sometimes pink-ish-purple or white depending on the variety) flowers grouped in clusters along a spike. 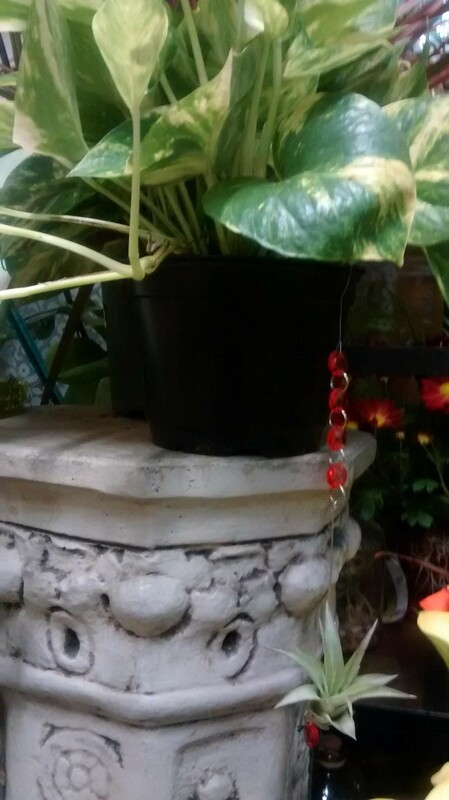 What makes this plant particularly interesting is that it blooms from the top downward. 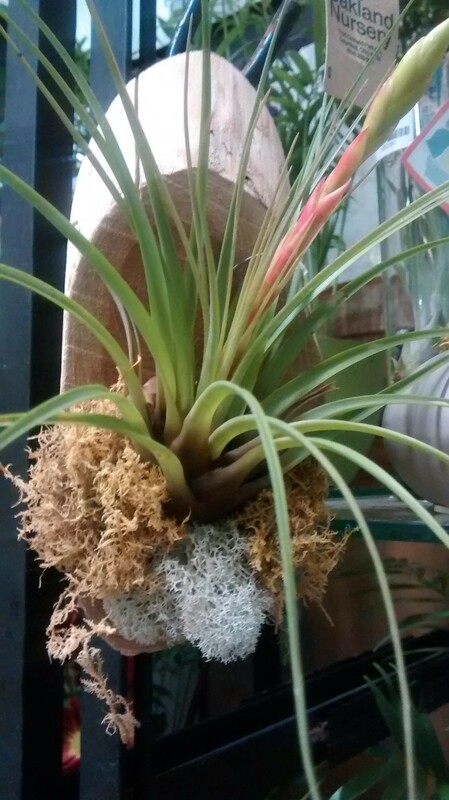 I am unaware of any other plant with this blooming habit. A great alternative to the popular, but invasive, loosestrife. Part sun to full sun. 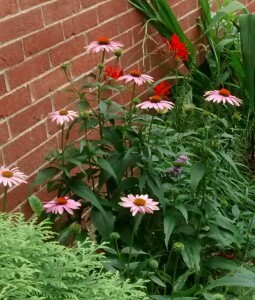 Echinacea purpera, Purple coneflower. 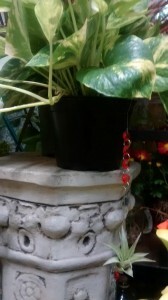 Reaches 26”-36” tall and can tolerate full sun to part sun. It blooms from mid-summer into fall. Seed heads attract birds in early winter if you choose not to dead head them in the fall. There are MANY varieties. growing 12”-26” tall, this perennial has a fine texture due to its narrow (thread) leaf. 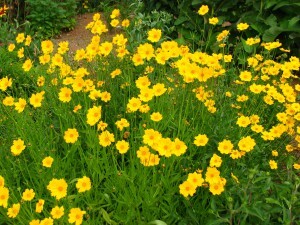 It profusely flowers bright yellow blooms in mid-summer. 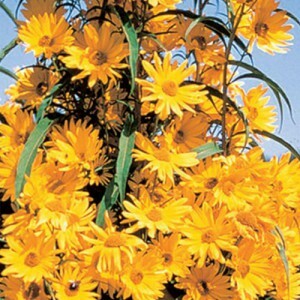 Some highly regarded varieties are ‘Golden showers’ and ‘Moonbeam.’ Part sun to full sun. Don’t worry, I have more plant lists up my sleeve! Happy Gardening! 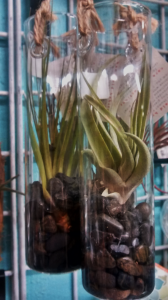 Posted in Gardening	| Comments Off on Water Your Plants! I like living in Ohio and having four seasons. There is of course good and bad – the random weather changes for example. Keeping us on our toes and remind us that we, as humans, cannot control everything. Besides, it’s something (other than sports) that bring us together as Ohioans; bemoaning the local weather is always common ground. The continual change of the seasons reminds me of the consistent change – whether natural or manipulated by us – in the garden. This spring has been somewhat turbulent thus far. A week straight of 86˚ highs to be followed by two nights of frost warnings. Today my son and I experienced one of these odd weather, seemingly random, changes and I thought it would make perfect blog banter. 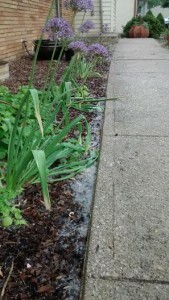 It “snowed” and rained at the same time this early afternoon. Yup, according to the eye of a 5 year old. Don’t worry I’m not going into a long story about how I adore my son. Just know that I do. But check this out…..We had a lovely spring shower and the sun managed to shine through the rain (okay, so far normalish Ohio spring happenings) ALL the while this soft white “snow” drifted on the light breeze. It was enough to collect along the side of my front walk. 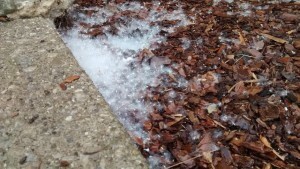 What is this “snow?” It’s a pile of Cottonwood seeds! (Populus deltoides) The female trees produce these light, fluffy seeds in the late Spring-early Summer, seeds that can produce trees that can grow up to 100 feet tall and live up to 100 years old. 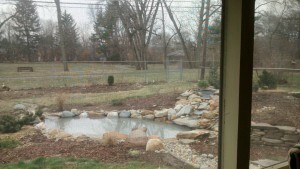 Happy Spring Happenings! Not sure what all the native plant hype is about? That’s okay. I’ll let you in on it: besides the whole ecological, good steward of the landscape angle it also makes good practical sense. Native plants are adapted to our climate and soil. I know- what a revelation, right? But think about it: native plants already love our crappy clay soil, they tolerate our manic temperature swings and get by with whatever water our local skies provide. Often times, natives are also hardy in the sense that they don’t have many pest or disease issues (except for pests and diseases that are not native, but we’ll save that for another time. I hate you, emerald ash borer!). 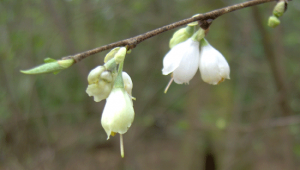 Carolina Silverbell, Halesia tetraptera: This native has delicate white bell-shaped blooms that usually appear in mid spring. 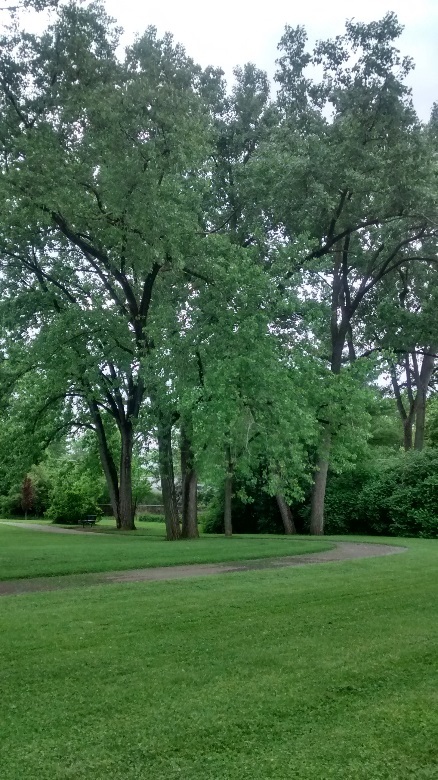 This small tree (30’-40 tall and 15’-30’ wide) likes full sun or part shade. 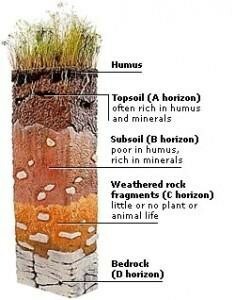 Although it thrives in well-drained organic, rich, and slightly acidic soil, it can tolerate a range of soils. It would be best to amend your existing clay with some compost at the time of planting and fertilize with a soil acidifier (Espoma organic holly tone would work if you already have it on hand). Oh, and it is essentially pest and disease free! 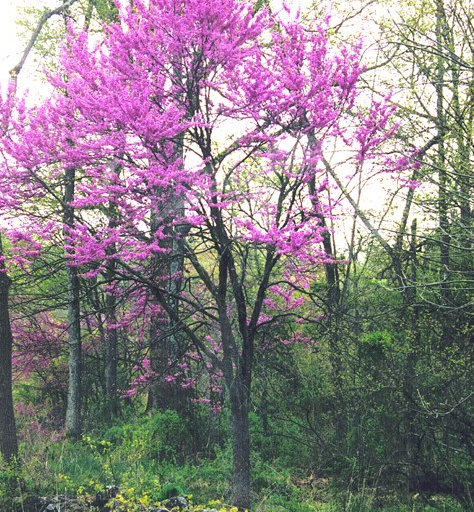 Eastern Redbud, Cercis canadensis: This little lady (25’ tall and 25’wide) can also be found as a single or multi-stemmed tree. It, hands down, has one of the longest bloom times, especially for a tree! The blooms have a small lady’s slipper shape with a light purple color that completely blankets the canopy and sometimes even pops up on the trunk. Gorgeous. Finding a natural stand of these while in bloom is an amazing experience. After the blooms fade broad heart-shaped leaves emerge. There are so many great cultivars of this tree, most requiring part sun, I’m going to make a separate post about them. 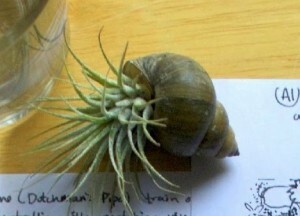 The only downside to this native is that it does not have a long life span, typically 25 years or so. I advise a Sunday drive throughout the Clintonville neighborhood – about two weeks after this is posted- if you need any more convincing. 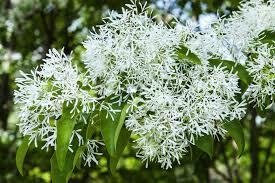 Fringetree, Chionanthus virginicus: Another small (15’ tall and 15’ wide) native that blooms in late spring. Narrow white petals drip from the branches and give off a sweet fragrance. Can tolerate full sun to part sun and I’ve even seen (and smelled) it in part shade. Nice broad leaf texture with yellow fall color. Very underused tree. A good specimen can be found behind the main downtown library in the (Seurat) Topiary Garden NW corner. 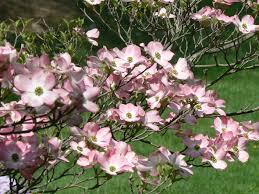 Dogwood, Cornus flordia: Another small tree, but this beauty needs some shade. 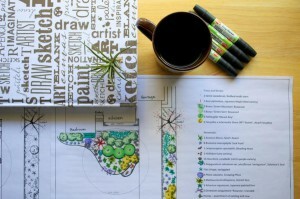 Ideally, plant in a place that receives morning sun and afternoon shade. There are many MANY cultivars of this tree, most with varying shades of white (50 shades of…dogwood?). “They” even have some out with some pretty interesting pink coloration. I’m partial to the Cherokee varieties, but you really can’t go wrong with any. This tree may drop its leaves early in the late summer/early fall if we have a dry hot summer – which is most of the time- but they usually won’t go without first splashing your yard with a little red color. 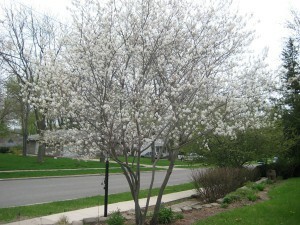 Want large native spring blooming trees? 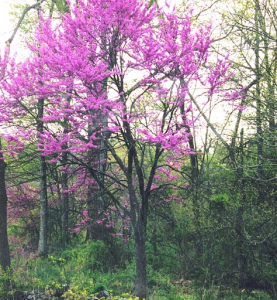 Look into Tulip poplar, Yellow wood and of course, the Buckeye! Maybe spring is coming? I’ve always loathed the month of March in Ohio for tricking me into thinking spring is on its way. Then it will snow. And back and forth, unable to decide whether spring has sprung or if winter is going to stick around a while longer. 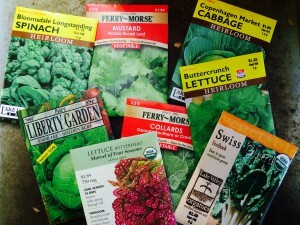 Each seed’s needs can be a little different, so follow the specific instructions on each seed packet. If you do decide to venture out into the garden and direct sow some cool season crops, don’t forget to bring along some compost to amend your soil with. Your veggies and flowers will reward you for your efforts. Speaking of seeding outside, how’s the old lawn?